No one questions that men are profoundly influenced by their fathers, but the shape and substance of that influence varies with each family. In this, the first anthology of nonfiction prose to explore this issue in depth, editor Steven Shepherd has collected a diverse and invariably compelling group of narratives about sons and their fathers. “Fourteen excellent essays by some of our best writers,” says Anne Morris of the Austin American-Statesman. 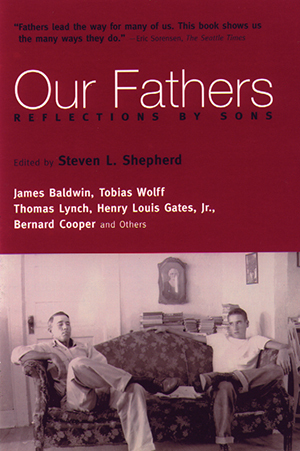 Among the contributors: James Baldwin, who reflects in his classic “Notes of a Native Son,” on the father he barely knew, “partly because we shared, in our different fashions, the vice of stubborn pride.” The brothers Geoffrey and Tobias Wolff, who write of their father from dramatically different perspectives. A second-generation undertaker, Thomas Lynch, who writes lovingly of burying his father. And the acclaimed scholar of African-American culture, Henry Louis Gates, Jr., who grew up with a father who “was not a race man,” yet their arguments were vital to the son’s education.